Sassy Sister Vintage is just that; super cool and sassy! When I found Kim's (the shop owner and designer) shop on Etsy I was drawn in immediately. From cool clothes, handmade jewelry, to home decor at REASONABLE prices, you will be taken as well. Sassy Sister Vintage sent me a one of a kind vintage marble necklace. I love the unique rustic look with "aged metal solder" around the marble. The chain is beautiful too. It has a copper, silver two-tone look that helps make the necklace a little extra special. I love wearing it. It gives my clothing ensembles a little extra color and style without over doing it. I've gotten compliments on it every time I've worn it. It really is the necklace that can be worn with anything. Audrey and me at Monster Jam sporting the necklace. Kim from Sassy Sister Vintage has one of these special necklaces to giveaway here on Tight Wad in Utah! It will be slightly different as the marbles are one of a kind. Are you excited! :) Join in the giveaway and check out Sassy Sister Vintage on Etsy, as well as Facebook. You will become addicted to this super hip shop! 1. Visit Sassy Sister Vintage and leave a comment on this post stating what you like about the site or your favorite item. Giveaway will end Thursday March 3rd at 10 p.m. MST. Winner will be chosen by Random.org. I was given the above product to review. No other compensation was received. All opinions are my own. All information gathered for the giveaway will be discarded when over. Your privacy is important. So many memories!! Love their shop. If I could just wear the clothes LOL But I love the necklaces and purses. I love the necklaces! so hard to choose! I love the jewelry, and will definitely be checking out their sister etsy store Mocking Magpie! 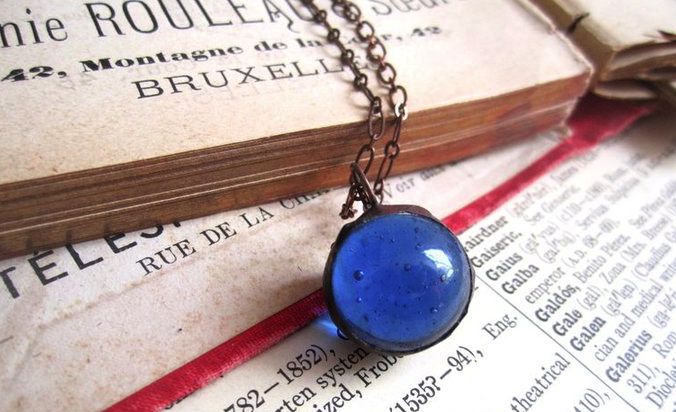 My favorite is the Baby Blue Vintage Glass Marble Necklace. So pretty! I like the Vintage 60s GREEN WOOL Plaid Cropped Jacket SKIRT Outfit MED. Funny, it's just my style...now. Hehe! I like the Vintage 1970s Orange Gold Sleeveless Party Dress. So pretty!! kristiedonelson(at)gmail(dot)com Thank you. I love the 1950's vintage dress with the pleats....so awesome!!! I like Sassy Sister's on Facebook. I love the 1960s vintage skirts! I love all the older style dresses. I alos like the green hat. I love the style of vintage. Too cute! I like the Vintage Guatamalan Tapestry Pillow. I like the midnight blue vintage glass necklace. I really like her book pages covered walls....and also the pink lace top. So pretty! Little WHITE Lamp Antique Vintage Cottage Style TASSEL Detail CUTE is fantastic and would look perfect on a home office desk. I love the clothes, vintage shoes, and the red cross under glass necklace. I follow you bt email. Perfect Vintage White Red Blue Cotton SAILOR Dress! Sailor stuff is the best! What a great site...I love it! I absolutely love the 1960s Vintage PLATFORM Stacked Heel Dark Umber Brown LEATHER Studded Loafers. Would love to wear those! I like the Vintage 1940s ART DECO Wooden Veneer Pendant Necklace REDS GREENS. I can't even pick out one favorite dress. Awesome! I love all of the vintage items...I especially love the glass marble necklaces! OMG - I love this shop! I really love their dresses from the 40s and 50s...especially the Vintage 1950s Semi Formal Pink Floral Strappy Prom Dress XS SM. Too bad it is so tiny! what a wonderful shop!! i'll be back again. I <3 the pink lace 50s cocktail dress. That is fabulous!! I love the vintage jewelry. Not that it would fit me, but my fave item is the Vintage 1950s Semi Formal Pink Floral Strappy Prom Dress XS SM!! SUPER CUTE! I love everything about the site I love the dresses and jewelry the best! I like Antique Fabric Specimen Under Glass Necklace. Very unique items, I filled the form out. I like the Dainty White Antique Vintage 3 Button Necklace. I like the Vintage 40s 50s Velvet and Taffeta Black Cocktail Party Dress SM MED. I love their selection of jewelry, especially the marble necklaces (so pretty!) and the Antique Vintage Rhinestone Buttons Necklace. I like the Old White Lace Specimen Under Glass Necklace.